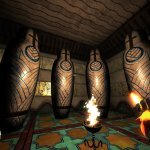 Having initially released on April 25th 2017 for Microsoft Windows, Immortal Redneck is the product of Spanish indie developer: Crema Games and sees a redneck (called Redneck) get transported back in time to ancient Egypt to unleash havoc across procedurally generated pyramids. 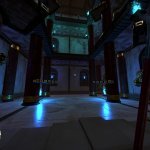 Combining old school FPS gameplay with ‘rogue-lite’ mechanics such as procedurally generated dungeons and a permadeath system that makes you choose your loadouts carefully, Immortal Redneck pays serious homage to old school shooters such as Doom and Unreal Tournament. The console port dropped on February 27th 2018 (Nintendo Switch port coming sometime in Q1 2018) and as usual I’ll be covering the PlayStation 4 version of the game, going over the good and the bad, and ultimately discussing whether it’s worth picking up at the £15.99 asking price. The first-person shooter genre is quite possibly one of the most popular staples of gaming today, accounting for 27% of overall video game sales in the 21st century. 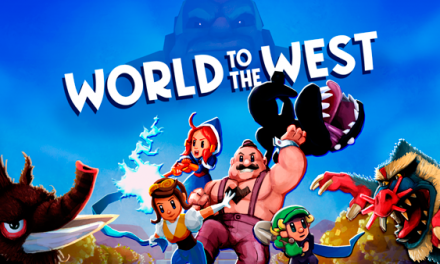 While the genre has its origins in the late 70’s and 80’s, the medium wouldn’t boom in popularity until the release of Wolfenstein 3D in 1992 as well as Doom in 1993, both of which would be the progenitors of the ‘old-school’ FPS as we know it today. 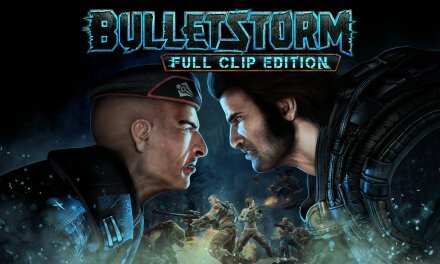 The popularity would later bleed into the likes of Quake and Unreal Tournament, defining what would become the first truly competitive arena shooters (even though no one truly had the patience for 56k dial-up) and while the days of the LAN connection are long since passed, advances in online multiplayer have ensured that the remnants of the ‘old-school’ spirit haven’t been lost, with multiplayer FPS games becoming more popular than sliced bread over the last decade or so. In terms of single player outings, there has been a rise in games adopting the fast-paced feel of old school shooter mechanics, with the most notable example being Doom (2016) that managed to capture the feel of the original title, offering fast-paced and solid gunplay, while keeping it within a modern gameplay format. 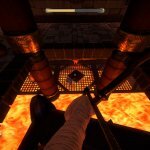 Immortal Redneck from Crema Games is another such example, which is described as a ‘rogue-lite’ FPS borrowing familiar elements from the sub-genre, such as procedurally generated dungeons and a permadeath system that sees you returned to the hub outside upon death, making you lose all your progress. The title follows a foul-mouthed redneck (called Redneck) who (after an accident) wakes up mummified in ancient Egypt. The game follows redneck as he traverses 3 procedurally generated pyramids in Giza, trying to find out why he’s been sent back in time as well as the reason why he’s been mummified, all while simultaneously battling an army of crazed monsters and huge, over-the-top bosses. If you’re thinking by this point that Immortal Redneck sounds insane, then you wouldn’t be alone, but what sets the game apart from its peers is that it’s developer: Crema Games have succeeded where many others have failed, by creating a game that captures the arcade-esque spirit and feel of classic shooters of yesteryear, while maintaining its own personality and sense of humour in the process. In terms of performance, Immortal Redneck ticks all the boxes. The game runs fluidly at 60fps in 3840x2160p on the PS4 Pro, boasting more detailed textures and better graphical fidelity out of the box, than the bog-standard PS4. Packaged then re-packaged: Redneck awakens mummified in ancient Egypt without a clue as to how he got there. Right off the bat, there isn’t much of a narrative to be found in Immortal Redneck, and that isn’t necessarily a bad thing. 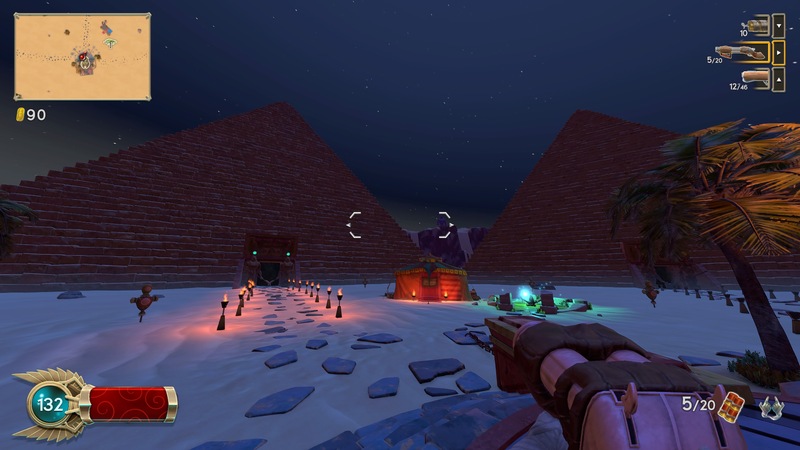 The title is billed as a ‘rogue-lite’ FPS, and lives up to its namesake entirely, offering 3 distinct pyramids that have rotating procedurally generated levels that change every time upon your death, resetting your progress entirely. Upon your death, any gold that was obtained from enemies can be used to upgrade Redneck’s skill tree, offering many passive benefits, stat increases as well as new skill and weapon sets in the form of ‘favors’ from the gods, of which there are 9 in total. 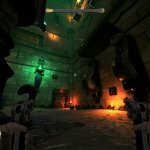 The general gameplay premise for Immortal Redneck is a combination of entering a room, clearing it of enemies and proceeding into the next room in the chain, and while this may sound ridiculously simple, it actually poses a decent amount of replayability; couple it together with some ridiculously fun gunplay and you’ve got a winning formula for a title that only gets better the more time you put into it (Redneck’s foul mouthed mid-combat quotes sweeten the deal even further). Speaking of weapons, the game features a plethora of different armaments, everything from magical ankhs, to AK47s, to potato launchers can be used to dispatch your enemies. 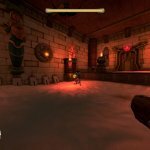 Immortal Redneck takes a lot of cues from Doom (2016) in the gunplay department, offering tight and frantic fast-paced combat that is overwhelmingly fun to play yet still a consistent challenge the further up the pyramids that you get. Each floor increases the damage of individual enemies, while increasing the loot gains from the floor prior; each pyramid also has a number of bosses that are by far the games strongest challenge (even if it is heavily annoying dying after making so much progress). 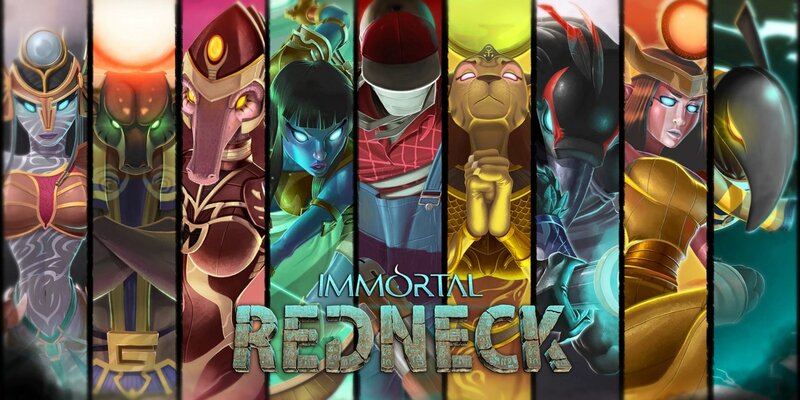 After some time of getting to learn the game’s mechanics is where Immortal Redneck comes to life, as the initial couple of hours offer very little in terms of progression or gameplay development. 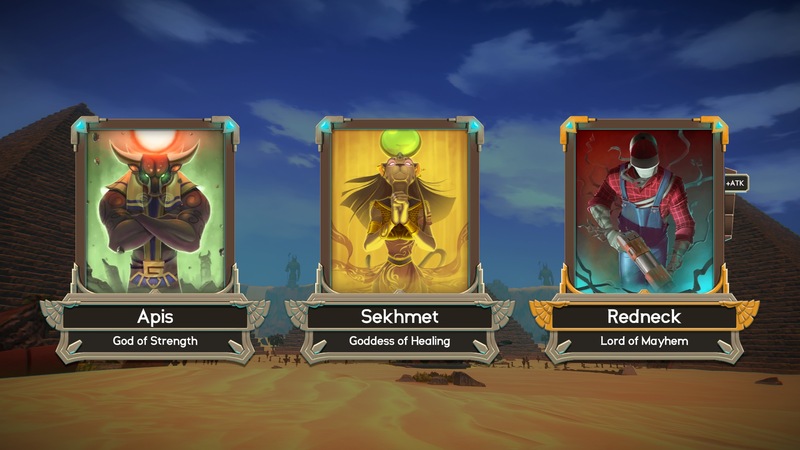 The aforementioned skill tree is where most of the development lies (which is quite a slow burner to begin with) eventually unlocking the games ‘favors’ of the ancient Egyptian gods, which offer different passive benefits, loadouts and signature abilities depending on your playstyle (they can also be upgraded too). 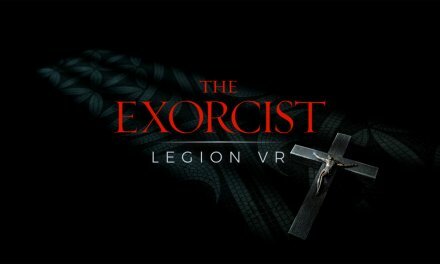 I spent the vast majority of the game playing under Sekhmet (the goddess of healing) which offered dual revolvers, flame spells, a spiritually-charged ankh as well as an ability to turn all lootable items on screen into steak (Rednecks do love their grilled meat) which act as the games healing items. In addition to the games skill tree is the merchant, who offers scrolls that act as gameplay modifiers which can drastically change the pace of the game; one of the most useful scrolls in the game keeps the dungeon layout of your previous crawl intact, giving you a second chance if you were having a particularly good run. While there is a lot of fun to be had in Immortal Redneck, the game does begin to get a bit tedious and repetitive towards the end of its 15 hour ‘campaign’ (longer if you don’t take to the mechanics that well). 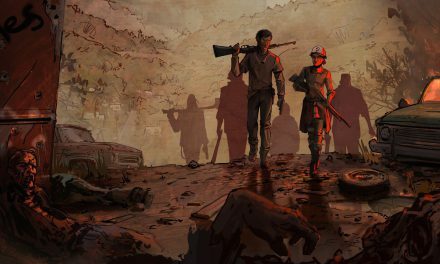 Overall, there’s not much to hate when it comes to Immortal Redneck, as it manages to capture the spirit of the old-school shooter and has genuinely fun gameplay to boot, albeit having an over the top and somewhat insane (or lack thereof) narrative direction. 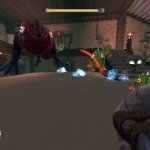 It won’t be a title for everyone, but if you’re looking for a fun arcade-esque shooter with a sense of humour, you could do a lot worse than Immortal Redneck. A review code was provided by Stride PR. "Oh my God, they cut off his bowling fingers!" 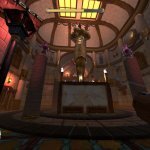 Verdict Over the top and batshit insane, Immortal Redneck is definitely one of the more unstable concepts for a video game I've had the pleasure of playing. However, the game succeeds at capturing the old-school feel of classic shooters such as Doom and Unreal Tournament, couple in a ridiculously fun and fast-paced combat system to boot and Immortal Redneck is definitely worth a bash, especially so if you're a die-hard fan of the genre. PreviousRetrograde II – Playstation Portable Problems – Why do we not have fond memories of the PSP?